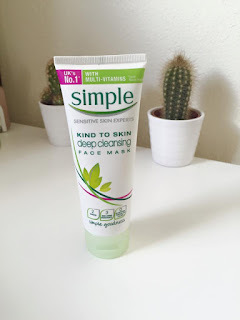 You may have seen my previous post about me trying a one brand skincare routine. 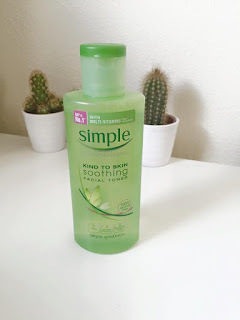 A few weeks ago I decided to make an order on Superdrug for new skin care I have always struggled with my skin so because Simple skincare products have always been good for my skin I thought I would try a new routine and use only simple products. 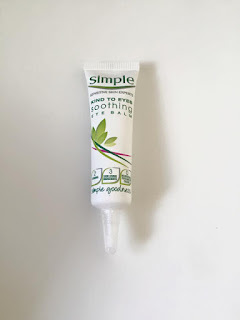 I have been using this Simple kind to skin face wash morning and night, I have been using it alongside my electric face cleansing brush. I really like this facial wash it makes my skin feel really clean without it feeling tight and dry. To remove my makeup I have been using this Simple kind to skin soothing facial toner. It removed my makeup so well I just apply some of the product onto a cotton pad and then remove all of my makeup. I also use this on a clean cotton pad after washing my face. After washing and toning my face (morning and night) I then use a good amount of moisturiser all over my face and neck but avoiding the eyes. I have oily skin so a light moisturiser is perfect for me. This moisturiser is really light but still leaves my skin feeling soft and moisturised. I then use the Simple kind to skin soothing eye cream. I have never used an eye cream before and I have no idea why! This particular eye cream didn't do anything extravagant for me id did make my under eyes feel more hydrated but I think I would need to use a brightening eye cream because my under eyes are puffy and also dark. Lastly I have been using the Simple kind to skin Deep cleansing face mask. This face mask is so nice to apply! It is really soothing and creamy. I have been using this mask in the evenings before washing my face 2-3 times a week. I have noticed such a difference in my skin! My skin is much smoother, less red and also a lot clearer. I still get the odd blemish but it usually goes down within a couple of days. Now my skin is a lot clearer I have noticed that my pores on my nose and my cheeks are really large, because of this my foundation doesn't apply as smoothly as I would like it to. I have done my research and I have ordered Origins clear improvement charcoal mask to clear pores and the Liz Earle gentle face exfoliator. Whilst researching I read that a charcoal face mask and light exfoliators are good for large pores. I am still going to use my Simple products but I think I will change the face wash and the mask. I will keep purchasing and trying out different skincare products until I find the combination of products that work well for my skin. Finding a good skincare regime which works for you is just about trial and error. I hope you enjoyed this post i would love it if you could comment down below which skin care products that work of you. 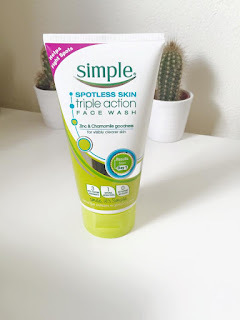 My sister always comes up with a rash when she uses simple products. it probably a chemical which your allergic to maybe. 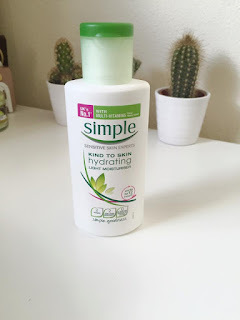 I use simple products and also use a botanics cleanser, I found when I used a clarins exfoliator my skin came up in a rash so I think more basic products are best for me.